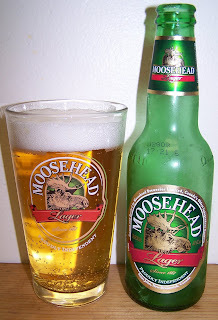 Yes, I am going to review Moosehead Lager. So let me tell you how I got to this point. I stopped off at State Line Liquors as I usually do on a Friday after work. This Friday’s rep tasting was Moosehead. I couldn’t walk past the man without sampling his beer. I haven’t had a Moosehead beer in years, many years. I was pleasantly surprised with the tasting. It really wasn’t a bad lager. So I bought a 12 pack since we are having my non-craft beer drinking family over this weekend for a birthday party. The rep though in a tumbler glass and the 12 pack came with a free bottle opener. 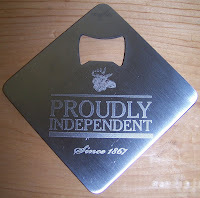 So I got a couple practical tools and a beer my brothers will drink. Pours a clear golden pale straw color with a bright white head. This is also a highly carbonated beer with lots of tiny bubbles rising up from the bottom of the glass. Light crystal malt? and a hint of flowering hops on the nose. This beer does not have that grainy aromas that most American lagers have. Light smooth and refreshing. I really can’t believe I just said that but it’s true. The taste starts out with a light malt sweetness then a very refreshing effervescence over the tongue followed by a hop drying finish without the hop bitterness and the final taste is a very clean and almost sweet fresh taste of hops and malt, although both or very subtle. This is really fresh clean refreshing beer. There is not much to it but there is nothing offensive or even unpleasant about it. And this style of beer, American Pale Lager, doesn’t have much going for it anyway. I purposely let this beer sit for a while to see how it is after it warms up. This is a very risky proposition for an American Pale Lager. I would not even attempt it with one of the macro lagers. Now at 70 degrees and this is still a drinkable beer. There is actually a fail amount of carbonation left in it also. I continue to be surprised by this beer, I thought for sure it would develop a foul or at least an unpleasant taste after warming up to 70 but it didn’t. This is a very good Pale Lager; clean and refreshing and it has a very pleasant fresh almost sweet finish. Now for a rating; wow this is a bit of dilemma for a craft beer enthusiast. Oh well I have to rate it like I always try to do, by style. So for an American Pale Lager this has got to be a B+ if not an A. It's been years since I have had a Moosehead... glad to see the review, though. Maybe I'll pick some up if my "non-craft beer drinking" relatives pay a visit. We made an incredible discovery today in Wisconsin: Tripel Karmeliet. I only purchased one bottle of this; it was expensive! But oh, the taste! This beats Leffe Blonde hands down. An amazing Belgian Ale. I hope you can find some out East. Even if your “non-craft beer drinking” relatives leave some behind it will not go to waste like Bud. Wow, that is fantastic that you found this bier out there. There is hope for the mid-west after all. This is my favorite Belgian Tripel, my “gold standard” if you will that I compare all Triples to. I had a keg of this at my Belgian Event (still need to post about that event). If you think the bottles are expensive you should see what a 20L keg cost. The 750ml bottles are about $11.00 around here. This is so exciting! Yes, this is an amazing Belgian ale. So if the store carries this they have to have other quality Belgians. Send me an email on what other Belgians you see there; I may be able to give you some recommendations. I'm not sure when I'll be allowed to stop back in to Steve's Liquors, but if you're ever near Madison, WI, they have a pretty decent beer selection. If I get back there, I'll try to list their Belgian Ales.